The term computer is derived from the word “COMPUTE” which means “to calculate”. So it is clear that the direct connection of Computer is with the calculator, its area is currently not only limited to computation but has become very widespread. The computer has its high storage capacity, speed, automation, capacity, accuracy, reliability memory of our life due to the power of memory every area is becoming important. Computer can be calculated in a more subtle time more rapidly, the results given by the computer are more pure. Now days, computer is being used in every area of ​​the world such as space, film production, traffic, industry trade, railway station, school, college, airport, etc. Computer where reservation of seats in airplanes, trains and hotels is done on one side, on the other hand, due to Computer, the functioning accuracy and speed is increasing. A computer is a machine or device that performs processes, calculations and operations based on instructions provided by a software or hardware program. It is designed to execute applications and provides a variety of solutions by combining integrated hardware and software components. Generation of computer in computer term is a change in technology a computer was being used. Initially, the generation term was used to distinguish between varying hardware technologies. But now days, generation includes both hardware and software, which together make up an entire computer system. There are totally five Generation of computer known till date. 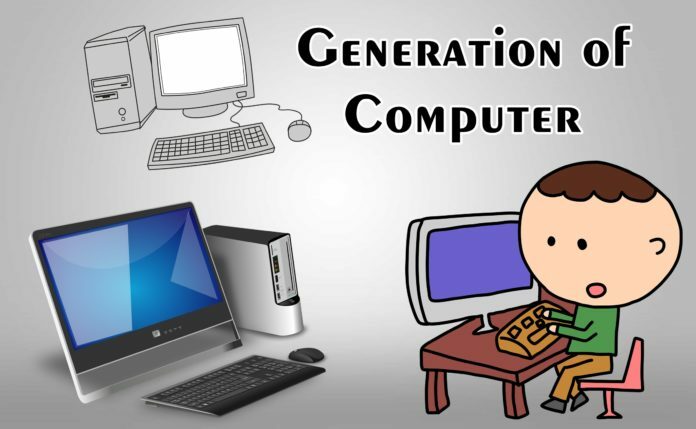 Each generations of computer has been discussed in detail along with their time period, advantages, disadvantages and examples. We have used approximate dates against each generation which are normally accepted. The beginning of commercial computer age is from UNIVAC (Universal Automatic Computer). It was developed by two scientists Mauchly and Echert at the Census Department of United States in 1947. The first Generation of computer were used during 1940-1956. They were based on vacuum tubes. Examples of first generation of computers are ENIVAC and UNIVAC-1. Vacuum tubes were the only electronic component available during those days. Vacuum tube technology made possible to make electronic digital computers. These computers could calculate data in millisecond. The computers were very large in size. They consumed a large amount of energy. They heated very soon due to thousands of vacuum tubes. They were not very reliable. Used magnetic drums which provide very less data storage. Used punch cards for input. Not versatile and very faulty. The Second Generation of computers used transistors. The scientists at Bell laboratories developed transistor in 1947. These scientists include John Barden, William Brattain and William Shockley. The size of the computers was decreased by replacing vacuum tubes with transistors. The examples of Second Generation of Computer are IBM 7094 series, IBM 1400 series and CDC 164 etc. Smaller in size as compared to the first generation computers. Used less energy and were not heated. Better portability as compared to the first generation computers. Used faster peripherals like tape drives, magnetic disks, printer etc. Used Assembly language instead of Machine language. Only used for specific purposes. Puch cards were used for input. The Third Generation of Computer used the integrated circuits (IC). Jack Kilby developed the concept of integrated circuit in 1958. It was an important invention in the computer field. The first IC was invented and used in 1961. The size of an IC is about 1/4 square inch. A single IC chip may contain thousands of transistors. The computer became smaller in size, faster, more reliable and less expensive. The examples of Third Generation of Computer are IBM 370, IBM System/360, UNIVAC 1108 and UNIVAC AC 9000 etc. Smaller in size as compared to previous generations. Produced less heat as compared to the previous two generations of computers. Better speed and could calculate data in nanoseconds. Used fan for heat discharge to prevent damage. Maintenance cost was low because hardware failure is reare. Could be used for high-level languages. Used mouse and keyboard for input. Highly sophisticated technology required for the manufacturing of IC chips. The fourth Generation of computer started with the invention of Microprocessor. The Microprocessor contains thousands of ICs. Ted Hoff produced the first microprocessor in 1971 for Intel. It was known as Intel 4004. The technology of integrated circuits improved rapidly. The LSI (Large Scale Integration) circuit and VLSI (Very Large Scale Integration) circuit was designed. It greatly reduced the size of computer. The size of modern Microprocessors is usually one square inch. It can contain millions of electronic circuits. The examples of Fourth Generation of computers are Apple Macintosh & IBM PC. More powerful and reliable than previous generations. Fast processing power with less power consumption. Fan for heat discharging and thus to keep cold. All types of High level languages can be used in this type of computers. The latest technology is required for manufacturing of Microprocessors. Fifth Generation of Computer is still running. Whose period is from 1980 till today’s date. This is the golden time of computer history. Where AI means Artificial Intelligence is going to change the world completely. Now VLSI Technologies has turned into ULSI (Ultra Large Scale Integration) technology. Due to this technology, more than 10 million transistors are present in a microscope. A CPU has been transformed into a small chip. The Fifth Generation of Computer has the secret of Parallel Processing Hardware and AI (Artificial Intelligence Technology). Once noticed, AI will know everywhere today. Like Mobile, Google Assistant, Image Recognition, Voice Search, Machine Learning, Spell Check, Expert in SYSTEM MEDICAL, Google Map. Because of this AI technology, today a computer is much faster than a human. AI means putting HUMAN brain into a computer. All high-level languages ​​come in this FIFTH generation. Developing an Expert System to make decisions in real life situations, especially in the medical field. Natural language is the process of processing human language in a digital way like you are doing in Google Voice Search. ULSI (Ultra Large Scale Integration) technology is being used in this generation. Artificial intelligence is being strengthened further. All the work is done on the concept of natural language processing. Parallel Processing is being done more. Superconductor technology is being upgraded further. Along with user-friendly interfaces, multimedia features are being given maximum importance. Because of the Voice Search, Image Recognition, deep learning, machine learning, this is the most different of the history of the fifth generation computer.